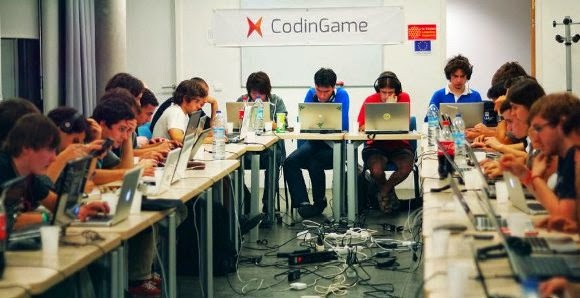 CodinGame startups launched its new platform dedicated to games, to allow developers worldwide to improve. Since early September, CodinGame offers programmers of all levels to practice and grow through an immersive platform based on the game "Indiana Jones to help out alive from a truffled maze rolling rocks, landing the shuttle Opportunity Mars or Thor triumph in the ultimate battle of Ragnarok are some examples of games on offer, which can be solved in 20 different programming languages​​. " Multiplayer dimension is also available, with the ability to work on artificial intelligence and program your own robot. Thousands of players can be accommodated simultaneously. According to Frederic Desmoulins, CEO of CodinGame "in the near future, video games will be more related to programming. Players no longer be content to move a character in a setting but may impact on their behavior and their environment by coding, as if they were in the Matrix. " CodinGame also offers online programming challenges, allowing developers to be recruited.